More and more of today's workplaces require a level of collaboration that panel systems just won't allow. e5 delivers the space-saving footprint and expansive power capabilities of a panel solution in an environment that promotes interaction, without the isolating walls. Easy-to-Power features include Technology Beltways and a variety of 8-wire/4-circuit Power Kits that will accommodate even the most tech-intensive environments. Benching applications make extremely efficient use of real estate while promoting collaboration. e5 makes benching even more comfortable and productive with options for standing-height worksurfaces and overhead storage. Worksurfaces cantilever into position and storage components simply slide and lock into place atop our Technology Walls - the load-bearing equivalent of our Technology Beltways. That is just one of many Easy-to-Install touches! The e5 common-sense approach to building a workspace makes it just as Easy to Specify private offices as collaborative environments. A variety of freestanding and wall-mounted components let you create near-endless configurations, in colors and finishes that range from traditional to ultra-modern . 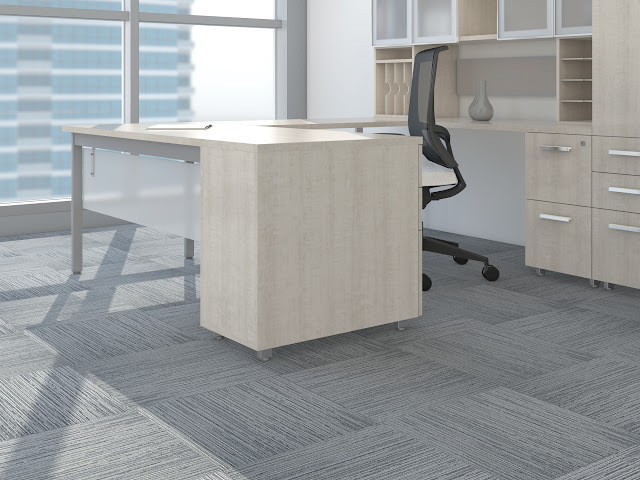 Use e5 throughout your office to create a unified look, feel and function while enhancing your Easy-to-Reconfigure flexibility. e5 is Easy to Afford for even the smallest companies. Because it is also Easy to Reconfigure , adding workers and transforming work environments is a piece of cake. You can re-purpose components into entirely new applications and expand office layouts with minimal disruption. Bulk up storage. Diversify function. Add more power, anywhere you want it. Whatever your needs, now and in the future, you can count on e5 for an easy solution. DESK WORKSURFACE - Choose from three desk top shapes (rectangular, hatchet or tapered) in a variety of sizes. 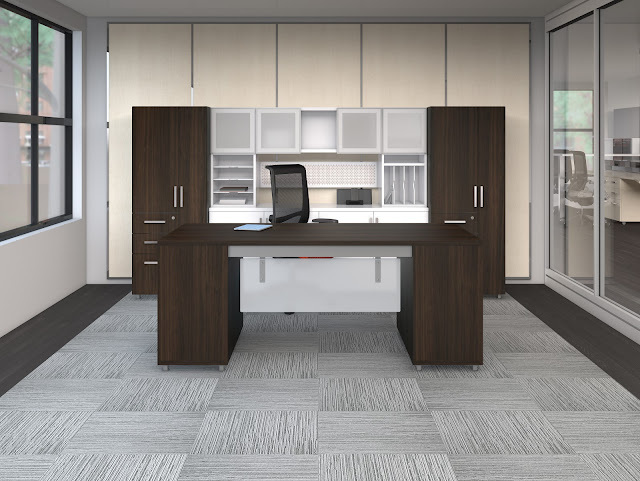 CREDENZA, RETURN, BRIDGE - Choose from a variety of rectangle worksurface sizes and support combinations to build a L-Shape or U-Shape workspace. 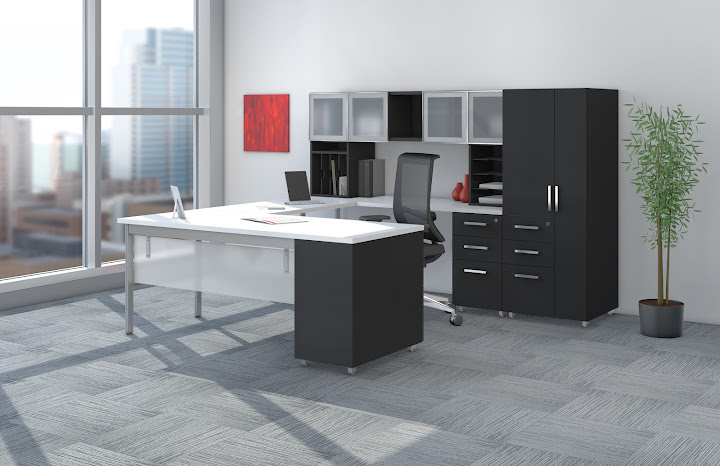 The Mayline e5 collection makes specifying your office design easy; choose a desk, credenza, bridge, and return assembly that is ordered with one model number complete as referenced above. 1 1/8" Thermally Fused Laminate worksurfaces available in 6 colors with matching 2mm PVC edging of Summer Suede, Cocoa, Biltmore Cherry, Designer White, Columbian Walnut and Raven. Legs available in White, Black and Silver. Specify paint color. Assemblies consist of a worksurface, support, surface support channel, and optional modesty panels. All assemblies include hardware and installation instructions. Optional modesty panels are available in frosted acrylic or laminate with attachment hardware included. Short legs are intended to be used with Layered Height Storage Cabinets. MODESTY PANELS - Each worksurface is available with or without a modesty panel. If you would like the complete assembly to have a modesty panel, you can choose the frosted Acrylic (Product Code Suffix MA) or Laminate (Product Code Suffix ML) version. Just search for the Product Code with the appropriate suffix to purchase the worksurface your preferred modesty panel. This e5 configuration highlights the efficient Worksurfaces, Storage Cabinets, Overhead Cabinet with frosted glass doors, Support Modules, Pedestals and Wardrobe Tower in Raven. The 3200 ergonomic office Chair is shown with a Black fabric seat and Mesh back. e5 makes even full-featured executive offices amazingly affordable. Worksurfaces, Pedestals and Wardrobe Towers in Columbian Walnut. Storage Cabinets, Overhead Cabinet with frosted glass doors and Support Modules in Designer White. Commute Chair in Tango fabric. A universal kit of parts eases specification in every area of your floor plan. Worksurface in Designer White. Storage Cabinets, Overhead Cabinet with laminate doors, Support Modules and Wardrobe Tower in Summer Suede. 3200 Chair in Black fabric.